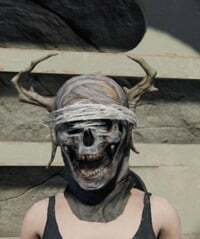 Ritual Mask is Head Armor in Fallout 76. Ritual Mask weights 0.5 and can be found after level ??. All armor pieces provide protection against physical and energy damage, as well as radiation. In Fallout 76, The amount of mitigation provided depends on the level of the piece. You can find this outfit in Little building NE of AVR Medical right beside the river.